At the November 13 Viaduct Stakeholder Advisory Committee meeting, the results of mobility studies on the eight viaduct options were presented. Reports by the Times and PI both focused on how the elevated option would provide shortest travel times by car, revealing the pathetically spent car-centric bias that has led to dismemberment by pavement in so many of our cities. The PWC also points out that the model assumes a 20 percent increase in vehicle miles traveled by 2015. But that assumption is based on the status quo, ignoring the inevitable hit VMTs will take from rising fuel costs and climate change, as well as trip reduction that occurs when people use their brains to respond to congested traffic conditions. My money’s still on a surface option. And I would not be surprised if option C becomes the favored surface option, since it no doubt provides more car capacity than A or B, and will be viewed as a compromise. But nope, I don’t much like it. The three-lane one-ways will encourage cars to travel too fast, and will create a more formidable pedestrian barrier on Western Ave. The intersection of Western Ave and Virginia at the north end of Pike Market would be particularly egregious. Color me down with Option B.
UPDATE: Also color me busted by commenter KeithR for not carefully reading the map, which shows an underpass for Western Ave at Virginia St. Still, from an urban design standpoint I’m still leaning towards B rather than C. I like the calm, pedestrian friendly character of Western Ave, for example at the bottom of Harbor Steps. I’m wary of an underpass, and how that will likely create a pedestrian barrier between Steinbrueck Park and Western Ave to the south, and then when it surfaces further to the north it will likely create more pedestrian barriers. And I think Alaskan Way is actually a pretty good location for a two-way multi-lane boulevard: there’s plenty of room for it, and as Matt the Engineer commented, a 3-lane one-way may leave too much open space. The energy of two-way boulevard seems appropriate for the waterfront, and overall the boulevard could contribute to the waterfront’s character and sense of place — think Champs-Élysées. Posted by dan bertolet on	Wednesday, November 19th, 2008 at 1:49 am. You can follow any responses to this entry through the RSS 2.0 feed. You can leave a response, or trackback from your own site. That sounds _very_ strange that the total VMT would be assumed constant in all scenarios. No model of traffic impacts should do that, and in fact it would be difficult to enforce that constraint in practice. It’s more likely that the number of trips per household and trips per job, per day, are held constant. So people, in the model, should be using their brains at least choose how far to travel on those trips, in terms of destination and route (not to mention mode, shifting those VMTs between modes). This is just standard practice in travel modeling. Also, as you point out, the choice of performance measure is critical. Neither “travel time” nor “trips served” is ideal. Better would be a total measure of accessibility for the region, and perhaps maps of accessibility for certain areas, for each scenario — where “accessibility” basically measures how many destinations can be reached, weighted by travel time. Still, I would be very surprised if the scenarios show much difference from each other. Option C brings back the Waterfront Streetcar at WSDOT’s expense AND gives the waterfront more open space versus the other plans. The couplets would be signalized and would most certainly be regulated far greater than most other busy streets in this city (Denny!) given its status as a state road. I can see why it’s the one to beat. I like it, personally. It also has almost the lowest downtime. C’mon 2012! Yup, I think Option C is the one most people are going to go with. I strongly dislike Option C, maybe even more than the Frank Chopp plan. Western is a very lively, relatively safe pedestrian street right now, especially between Columbia and the Market. The node at Virgina, as Dan referenced, is particularly pedestrian dominated. It’s also a bottleneck for cars ALREADY, and that’s with two way traffic. What would this scheme do to Victor Steinb’k park? What would it do to the furniture stores on Western? Basically Harbor Steps would empty onto a freeway? I like Option C due to the larger waterfront area. 104-114′ of open space compared to 76′-86′ for option B. As for the Virginia intersection, if you look at the PDF detail map, there is an underpass there. So, access from the Market to the park will be BETTER with option C.
Also, there are traffic lights at every intersection on Western and Alaskan. It’s going to be like any other downtown street. Yes more traffic than now, but by no means a freeway. I can tell you this much, with 100+ ft of open space on the waterfront, those bike lanes in the street are going to be pretty empty. Interesting about that underpass. has anyone seen more detailed plans for that? 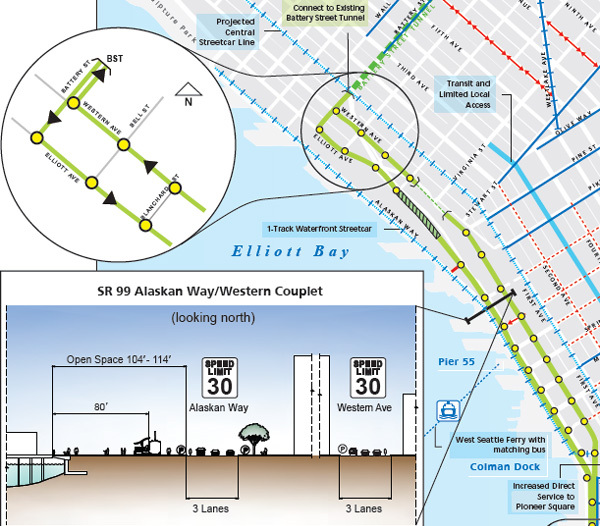 What is the SDOT defined difference between the underpass and tunnel? Well, I’m not sure if two separated 3 lane streets are better or worse than a 4 land boulevard. I’m leaning towards worse, but the thing I really don’t like about Option C is that it leaves off the streetcar extensions, which lessens its value as a transit expansion. It’s certainly better than Frank Chopp’s joke of a design. I talked to someone who was present when he led this design group, and according to him, it was all everyone could do to not break out laughing at the idea. It is, indeed, utterly laughable. My take is that the extra streetcars for Option B over C could be added later, but you can’t fix the waterfront later. Since option C is my favorite waterfront layout (mainly due to the extra open space), I’ll take that even without the Ballard (where I live) and University streetcars (all the rest are still in Option C). B is now my favorite, because of streetcars and because I’m afraid C leaves a bit too much open space, which could go badly if not designed well (this rendering is what turned me off). But I’d be much happier with C than any of the others. I’m definitely leaning towards the couplet of Alaskan/Western (Option ‘C’). This could very well be our last chance to have any sort of central park in downtown. This gives the waterfront the most open space. Plus, it has more lanes than the surface boulevard options (A&B) and spreads the traffic out which would reduce congestion and noise on the waterfront. Second choice would be the cut and cover tunnel (option ‘G’). This opens up a huge amount of open space in Belltown, which is almost as good as open space on the waterfront. Plus, it provides the bypass our overly-subsidized port so clamors for. Third would be option ‘B’, obviously for the excellent transit improvements. Although, I can’t for the life of me see why they wouldn’t include those with ‘C’. Yeah, Keo makes a strong point, why not option ‘C’ with the added transit additions. I also think C would do well to spread the cars out a little more and cutting down on their waterfront presence which would be really really cool. I suppose this is a minor concern in the big scheme of things, but Option C would entail moving a historic brick building (building where Il Bocchachino (SP? )is located) slightly to the west in order to provide enough right-of-way for the northbound couplet. I personally think a 3-lane one-way street would pretty much destroy the character of a chunk of Pioneer Square and Western Ave, but perhaps that is the price to pay for more room on the waterfront. I think I’m coming around to B as well. I was picturing vast extra green space with C versus B, but 30′ of extra bricked sidewalk isn’t worth messing with Western. It’s tough to go off their obviously rough mockups. If there was something cool that you could do with the waterfront in 104′-114′ feet as opposed to 76′-86′, then I’m still a C fan. Otherwise B is fine. How does 104′-114′ feet compare to say Portland’s waterfront park? The mockups are terrible and if it ended up looking anything like that it would be a gigantic waste of space. However, I can easily imagine it being much more interesting. 1.) Crossing. The key to reconnecting downtown with the waterfront is the ease of pedestrian crossing. We all agree on this. I believe that two 3-lane streets presents a more pleasant crossing than the 4-lane, which is actually a 5-lane when you include the median. with C, you basically cross 40 feet, then have a break while you’re walking a block and then cross another 40 feet, as opposed to B where you have to cross about 70 feet all at once. Crossing such a wide gulf is unpleasant. Think about it, which street is easier to cross: 5th AND 4th downtown or Denny? In addition to making the crossing distance shorter, the fact that all of the traffic is coming from one direction also makes crossing less intimidating. You don’t have to look both ways, just one way and you can keep an eye on all of the potential incoming traffic while you cross. 2.) I actually think Western could benefit from a bit more traffic, hard as that may be to believe. Western seems empty, and frankly a little scary to me. It’s a dark street and the fact that there is so little pedestrian and vehicle traffic makes a person feel alone in a city, which is unpleasant. If there are vehicles driving by to be potential witnesses, I feel I’m less likely to be mugged. 3.) Couplets are more flexible for the future. My dream, would be to build the 6-lane couplet today, and then in 10 or 20 years (maybe sooner) turn two of those lanes into transit only lanes, either for streetcar or buses, or if we’ve already build grade separated transit elsewhere, turn those lanes into wider sidewalks (like we did on pine street) or more on street parking, which would help the retail. Dropping two vehicle lanes from option C would amount to a 33% drop in capacity, while dropping dropping two lanes from A or B would amount to a 50% decrease. You all may think this is unrealistic, but I think we have a much better shot at a 33% reduction than a 50% reduction. Portland waterfront park is 200′ wide on average, plus an additional 70′ for the width of Naito Parkway adjacent to the park, to the buildings that line the street. So you have about 270′ from the buildings to the river. There are places where it is wider and narrower as well. Well argued by Tony, above. I would hesitate to compare to Portland since their waterfront is designed more like Myrtle Edwards, with grass and trees and such. This would function differently as more of a shopping boulevard, say, like the Rambles in Barcelona (we can only hope!). Tony says it beautifully, and I agree. Option 3 is probably the most versatile and the most pedestrian friendly overall. I agree with Dan that the bottom of the harbor steps won’t be as delightful, but something like a raised pedestrian walkway could help to prioritize the pedestrian there.